Switching to CFL or LED - How Much Could you Save? 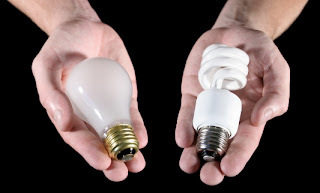 Until recently, I never really knew how much energy (and money) you can save by switching your standard incandescent light bulbs to the energy efficient Compact Fluorescent Light (CFL) or Light Emitting Diode (LED) light bulbs. So I thought I would share a little comparison on the costs and savings between incandescent, CFL, and LED light bulbs. Traditionally, the common light bulbs found in most households were 60watt or 100watt incandescent bulbs. So let's compare a 100 watt light bulb with CFL and LED light bulbs that produce an equal amount of light. In the examples, we'll assume that each light bulb is running continuously for 1 year. 100 Watts per hour (watt hours) X 24 hours a day X 365 days a year is 876,000 watt hours - or 876 kilowatt hours. Assuming you pay about $0.08 per KWh like I do, this comes to about $70.00 per year running continuously for 24 hours a day. A 26 Watt CFL is roughly the same amount of light from a 100 watt light bulb. 26 watt hours X 24 hours a day X 365 days is 227,760 watt hours - or 227.76 KWh. At $.08 per KWh, it costs about $18.22 to run a CFL continuously for 1 year. A 12 Watt LED is equal to the 100 watt light bulb. 12 watt hours X 24 hours X 365 days equals about 105,120 watt hours - 105.1 KWh. So a 100 watt equivalent LED light will cost about $8.40 per year to run continuously. Even when you factor in the purchase cost of CFL and LED lights, you still save. With my calculations, i never factored in bulb life as that would get too complicated, but it would still be a significant savings. To extend the savings even more, every electric utility company in Iowa, and I assume most of the united states, offers a rebate for every Energy Star rated bulb you buy. In Iowa, it's 50% of the bulb cost. So a $10 LED bulb would cost you $5, and save you about $57 a year if you replaced it with an ancandescent that was left on 24 hours a day. If every American home replaced just ONE light bulb with a light bulb that's earned the ENERGY STAR, we would save enough energy to light 3 million homes for a year, save about $600 million in annual energy costs, and prevent 9 billion pounds of greenhouse gas emissions per year, equivalent to those from about 800,000 cars. That, to me, makes it all worth it. DIY How to Build a Wind Turbine with a Treadmill Motor.